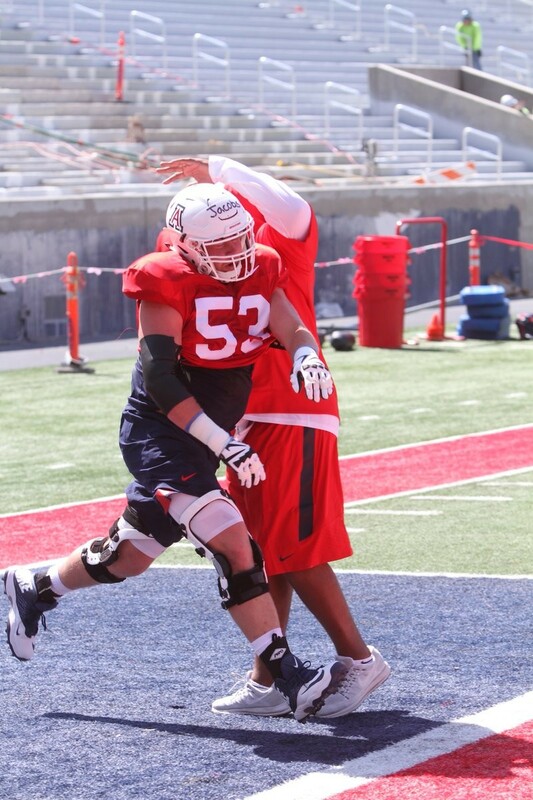 Jon Jacobs of Arizona goes through an offensive line drill during the Wildcats' practice on Tuesday, Aug. 7. Tony Fields II sees a bright future for the Arizona Wildcats’ defense, a year after being named to ESPN’s Freshman All-American team. Fields, who had 104 tackles, 7.5 tackles for loss, 5 sacks and an interception as a freshman last season, believes the team is in for a defensive renaissance this fall. Part of his gushing confidence comes from the continuity he and his defensive brethren have in third year Defensive Coordinator Marcel Yates. It also comes from the trio of dynamic linebackers that the Wildcats have, in Fields, Colin Schooler and Jacob Colacion, who combined for 206 tackles and 3 interceptions a year ago. Fields admits that he made mistakes on defense as a freshman but believes that he’s in better shape and is better prepared heading into his sophomore campaign. Yates believes that Fields and Schooler will have big years this season, saying that the duo and the Wildcats revamped defensive line, including Derek Boles and PJ Johnson, can up their defensive fortunes. Shoring up the defensive side of the ball will be key for Yates and Coach Kevin Sumlin, coming off a 2017 season where the Wildcats ranked 10th in the Pac-12 in points allowed (34.4) and yards per game allowed (471.2). Their rushing defense ranked ninth in the conference, allowing 185.1 yards per game, with their pass defense ranking dead-last, at 286.1 YPG. Fields believes the team’s biggest step towards righting their defensive deficiencies is in their improved depth and talent level. He believes the team will have the talent in the secondary and at linebacker to stymie opposing offenses on the ground, while the secondary will ground opponent’s passing attacks. He believes the offseason work undertaken by safeties, like freshmen Dayven Coleman and Christian Young as well as senior Demetrius Flannigan-Fowles, will help shore up their pass defense this year. The biggest improvement for the Wildcats this fall, according to Yates, is the on-field comfort level that players like Fields, Schooler and Flannigan-Fowles have with each other and with the system that the UA has had in place. "All those guys they go from trying to learn the defense to trying to learn, ‘OK, how is the offense going to attack us,’ which is a huge difference,” Fields said. Fields has a set of expectations laid out for his sophomore season that he would not disclose publicly but says fans will be in for a treat when their season kicks off on Sept. 1 against Brigham Young University in Tucson. He says his teamwide goal for the season is to hold opponents to 13 points per game, some 21 points lower than the 34.4 points per game they surrendered in 2017. He believes that Sumlin and Yates are the right men to lead them forward and that the team’s brightest days lie ahead, starting with the Cougars some 23 days from now.